Richard Mille has a passion for the technical, as demonstrated by the exceptional watches he has been creating for 11 years. But his continual quest for innovation, performance and design drives him ever onwards to other challenges. This is how he became interested in cufflinks, the sophisticated accessory that men take as much pleasure in choosing and wearing as they do their watches. Synonymous with elegance and refinemet, cufflinks have existed since time immemorial. But it was in the 17th century that they truly became objects of fashion and glamour. Over the centuries, cufflinks have become an item of jewellery showcasing plays on shapes and materials. Now, Richard Mille has taken on the challenge of transforming these objects, the natural complement to his watches, into a veritable work of technical artistry. First there were the traditional chain cufflinks, then the pivoting T-bar cufflinks. And now Richard Mille’s innovative spirit is bringing truly inventive technical solutions to these objects, making them a true reflection of their time. Richard Mille’s cufflinks have been devised according to the same principles that underpin the design of his timepieces. They had to be innovative, complex, extremely technical, but also reliable, practical and aesthetically pleasing. The specifiations were respected to the letter and the categorical results are here for all to see! The Richard Mille automatic cufflinks take their inspiration from the same process of creation and development as a Richard Mille watch movement. Two years of work went into creating and designing these exceptional, highly technical and refined piees, consisting of no fewer than 38 components each. Made from grade 5 titanium, they inaugurate a groundbreaking and patented mechanism that opens the bars using a push-piece. Unlike the classic mechanism, where a pivoting bar on the cufflink holds the double uff in place, Richard Mille’s design fastens the cuff using two titanium bars. These open with a simple press of the push-piece and close by pressing on the top plate. Another exceptional feature of the Richard Mille automatic cufflinks is the care devoted to every aesthetic detail and to the finishs. The cufflinks’ upper surfaces are satin-brushed, bead-blasted and bevelled by hand, creating an exceptional finish of the utmost elegance. 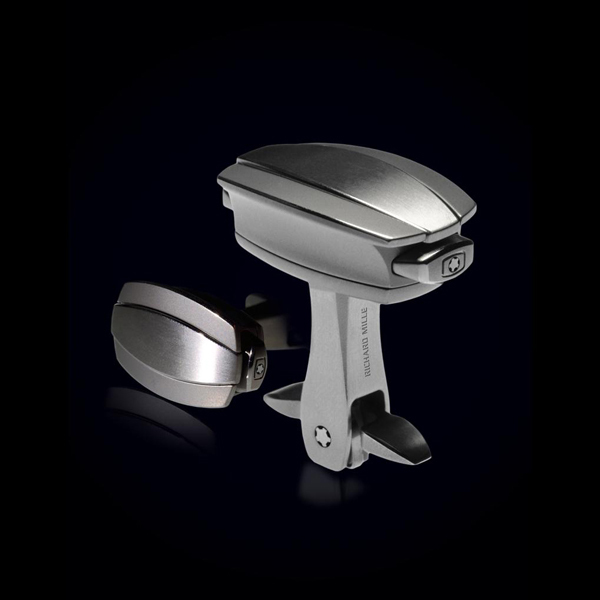 Available in Richard Mille boutiques and points of sale from October, the RM cufflinks are guaranteed for two years. Initially available in titanium, a diamond-set version will follow.